The event we’ve been anticipating and dreading has arrived. The lake has frozen over. 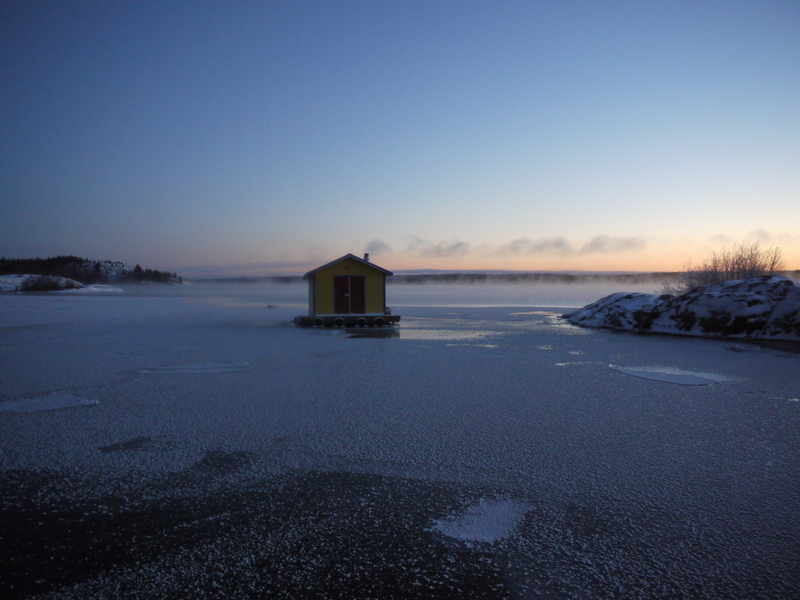 We’ve been very much looking forward to the lake freezing up, a chance to put away that poor hardworking outboard, which had to start up in minus 10 degrees take us to shore, with a frozen gear switch, a frozen propeller and a frozen steering mechanism. We also won’t miss the frozen lines – its tough trying to tie up a boat with ropes as stiff as a tree branch. We’ve also been dreading it too – its a great unknown. The freeze up process can take a few weeks and passage can be impossible at times. Yesterday, just like that, it happened. While Hurricane Sandy ripped through the eastern seaboard, nature here in Yellowknife crept in like a thief in the night. We went to bed 2 nights ago thinking it must be quite calm on the water, as suddenly there was no noise of the water slapping against the big metal pontoons on which we float. (Interestingly, as the temperature got cooler over the last week, the sound of the waves was more sluggish – you could hear the water thickening.) 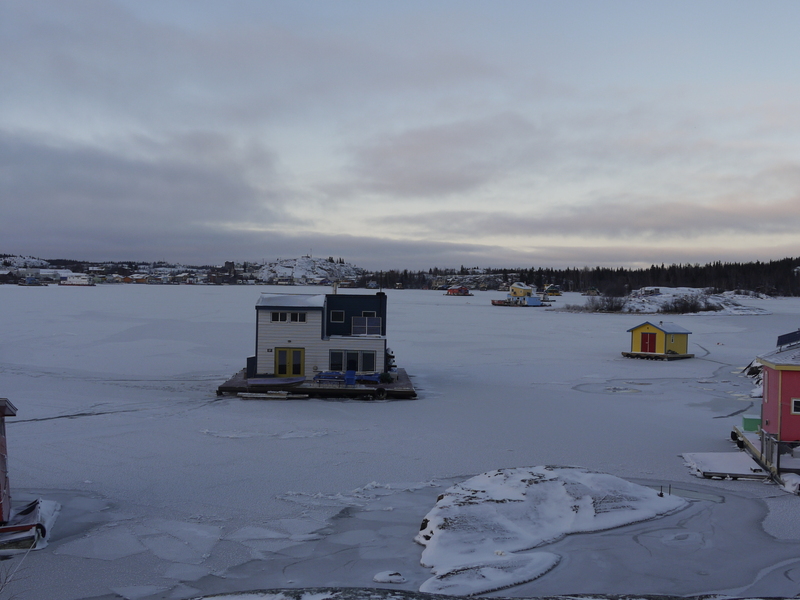 When we looked outside we were surprised to see a thin layer of ice forming around the house, and in the nearby bay. When we woke up in the morning, the whole area between us and town, a distance of some hundreds of meters, was frozen over. Imagine going from completely open water to fully frozen in overnight. It was astonishingly beautiful. 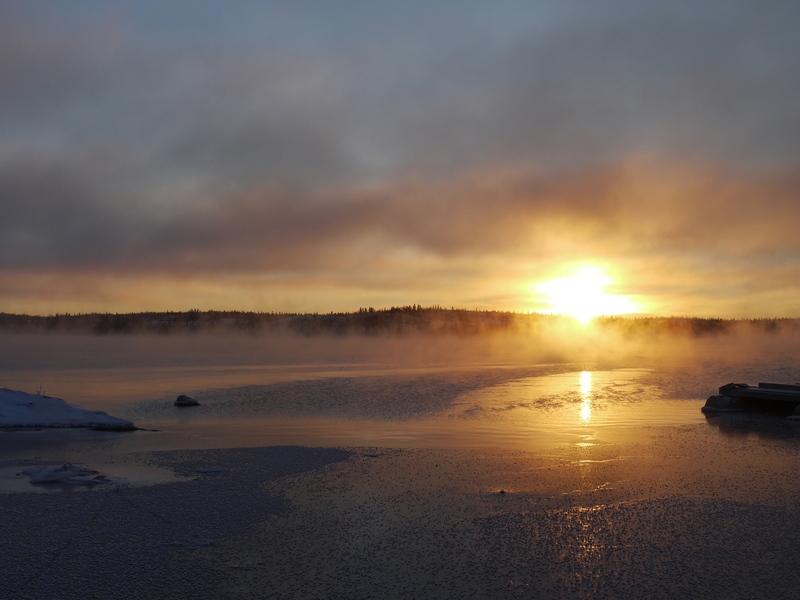 The open water to the east of us was covered in thick fog, and the hoarfrost glistened under the sunrise. Needless to say, we were not prepared. I was supposed to be in town at 9 am for a CPR course. (I do actually already know how to do it, in case you’re worried.) The poor Minnow was encased in about 3 inches of ice. We chopped it out, fired up that old reliable motor and tried to head to shore. 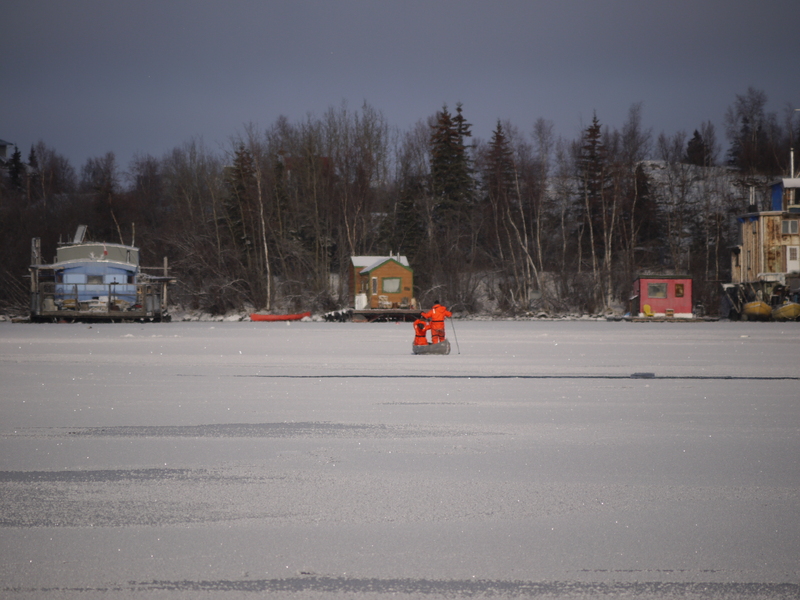 There was some thin ice near the house and we made some progress until we arrived at a thicker layer. Even running the bow of the boat up onto it wouldn’t break it. Next we tried to chop it with an axe, and I suppose if I had all day, that would have worked. It was so thick that the axe wouldn’t open up the water either. We gave up and retreated home. Only to look up and see our ingenious neighbor going by on his way to work. I think it took him about 5 minutes to cross from his house to the marsh, the closest point. This pose looks like something out of the Sears catalog! During all of this, we were able to see how our neighbors dealt with the ice crossing. One poor soul tried to paddle across in his canoe, but didn’t get too far. 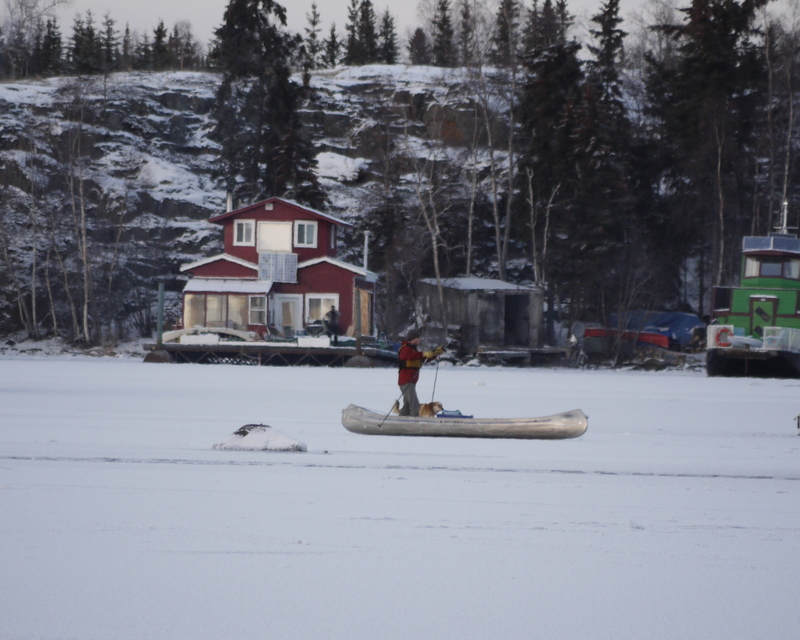 He then resorted to walking on the ice, dragging along his heavy canoe in case the ice broke. It took a while. 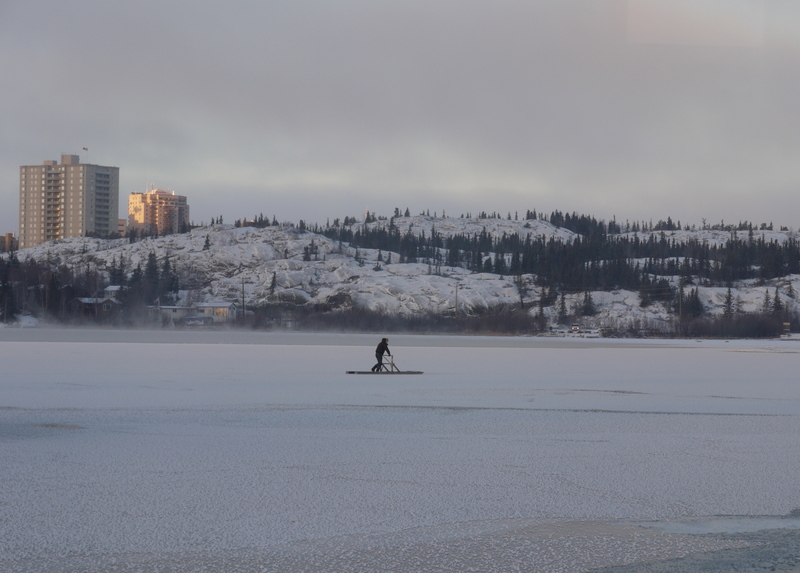 Other folks take their canoe on top of the ice, either sitting or standing, and propelling themselves with ski poles. You can do this either tandem or solo. It is fast and looks like fun. Ice canoeing, the next new Olympic sport? It was a spectacular day. The sun shone in a blue sky, something we’ve not seen for weeks now. We saw a flock of ptarmigans, a fox, bald eagles and a murder of ravens. We also found some footprints on the island – probably fox and possibly mink too. They seem not to be inhibited by the fact that the don’t have a canoe or ice walker. After practicing on the ice during the sunlight, I felt bold enough to go out after dark and use that expensive concert ticket I’d purchased. The National Arts Centre Orchestra from Ottawa was in town. They played a program of northern music, including a piece composed by an Inuit woman, Alexina Louie. It was a very alternative composition, with unusual percussion, a violin, cello, clarinet, bassoon and trombone. It also included 2 throat singers. If you’ve not heard throat singers before, you are missing something. This is a traditional Inuit craft, only practiced by the women I believe. Two of them face each other and create eerie guttural sounds. It can be quite varied and is compelling. The two women last night were both young and beautiful. Both were tall, with great fashionable heels, and atop that was a modern fashion take on a traditional Inuit woman’s garment. Innovative yet traditional. It was beautiful, the women, their singing, and the music. The piece was called Take Out The Dog Sled, and one movement, called Snow Geese, sounded just like that. It was music to bring to life the land and the traditions of the people. See it if you can. 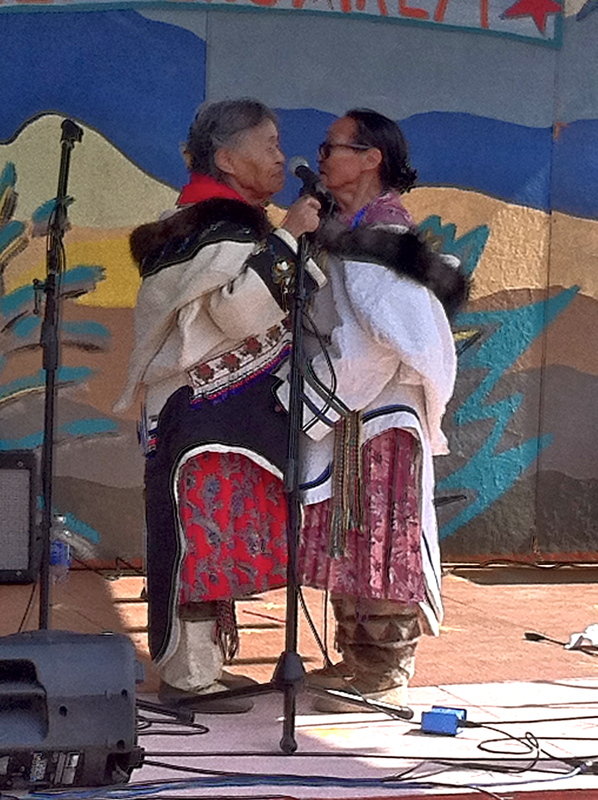 I saw these two women throat singers earlier this summer. The last half of the evening was Vivaldi’s Four Seasons. I’ve heard it many times before but this was my favorite. The music is inspiring, vivacious and uplifting. Soloist James Ehnes on his violin displayed passion and that level of ability that can only come with a lifetime of mastery. The orchestra was inspired and became a sum greater than its parts. The conductor was probably the man behind it all – the way he communicated to his musicians was a work of art itself. It was a spectacular evening. Afterwards I came home in the dark. Through the tall grasses of the marsh, now dried to a beautiful wheat color. They reach nearly to my shoulder. In the light of my headlamp everything sparkled finely, like it was all spun with silver. Out on the ice, the solid ice, the hoarfrost was impossibly long, the ice covered under the moonlight with a fur of fragile white lace. There was a full moon in the sky and another bursting in my heart. This entry was posted in North of 60, photos, The Song I Live By and tagged ice, Inuit throat singing, nature photos. Bookmark the permalink. 3 Responses to The Iceman Cometh! I for one will be happy when the iceman is here to stay. i think Kona and Ginger are with me on that. Each morning must be a surprise. Life seems so boring at our house. We just go to the heated garage and start the warm car. Such decadence. We will no longer take it for granted. Guess you didn’t have any trick ot treaters! Take care. Love Mom. Hello Nel in Scotland! I’ve been to Scotland and I thought it was pretty chilly. Damp cold is very cold. Here it’s dry and doesn’t seem as bad. Thank you very much for stopping by and commenting. I appreciate it.